Green Gathering Moment VOL-VI. Gathering of the tribe. A loud Shout Out to all the beautiful souls around the globe. Green Gathering is back again on Vol-VI with the full moon to celebrate our yearly celebration of conservation and protection of environment by dancing and letting go.. During the gathering you can interact with the peoples, friends, artists, teachers thus virtually everyone as our aim is to get into One single consciousness on helping and healing each other with the high energy of the full moon. Our gathering aims to foster a creative and collaborative atmosphere of caring, sharing, openness and kindness. For that reason, it can be magical, trans formative and often life-changing experiences for many of those who attend. Our gathering provides access to incredible nature, music, visionary art installation, performances, spiritual education, relaxation and healing and performances. Many different lectures & workshops are available where you can learn from various experts and leading alternative thinkers or share your own knowledge. Creating Oneness, Rainbows, and Re connection to the nature. 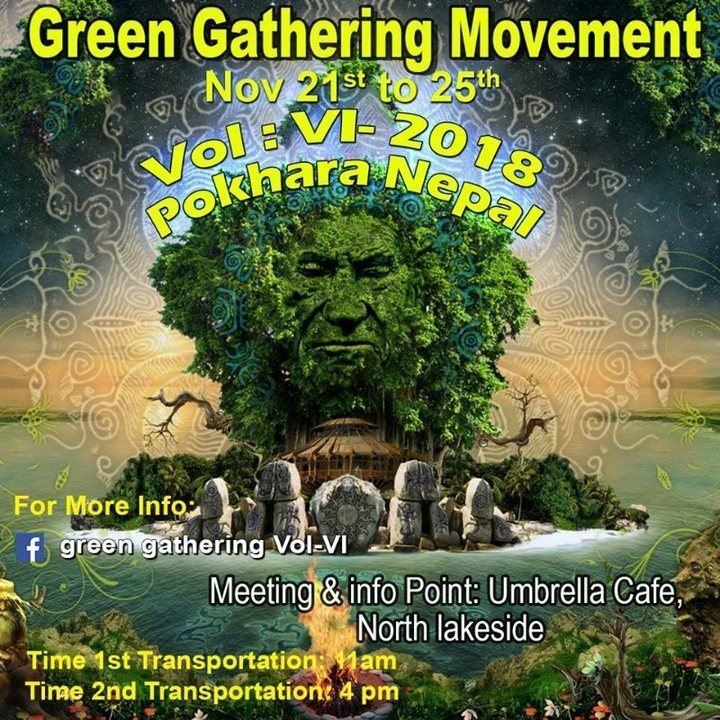 20% of net profit from the gathering will be donated to The Unity Eco village non profitable organization for the conservation and preservation of Environment. Genre from Ambient, Chill out/ psychill, fusion, techno, world, rock, Progressive, Minimal, Trance, Psy Trance, Prog Forest, Dark forest, Hitech, and more will be played. Workshops on varieties of field and disciplines will also be organized. Join us in the journey of Awakening towards oneness. Progressive, full on Psy Trance, Prog Forest, Dark forest, Hitech, and more will be played. Psy chill, ambient, fusion, Techno, minimal techno, acoustic, Blues, Funk, and many more. More of the information available at Meeting and Ticketpoint. -YOU WILL HAVE TO BRING YOUR OWN CAMPING GEARS. Shuttle Bus leaves from Umbrella Cafe from 10AM on 21st November. The Shuttle Charge is 300 one way and it will take 2 hours on the top of the hill. Our gathering doesn't promotes any brand and is solely dependent upon donations and gatherers so with due respect we hope to see you with tickets as a return of gratitude for our hard work, passion and future. love n' light. (1) week before in advance at our Pokhara Meeting point place .